“The river flow peaked for three days at 4,000 cubic feet per second (cfs) and will drop to 1,000 cfs for the first three weeks of April,” according to environmentalist and longtime Grand Canyon river guide Tom Huntington who was on the ground for the event last week to lead the historic Colorado River “pulse flow” rafting trip. 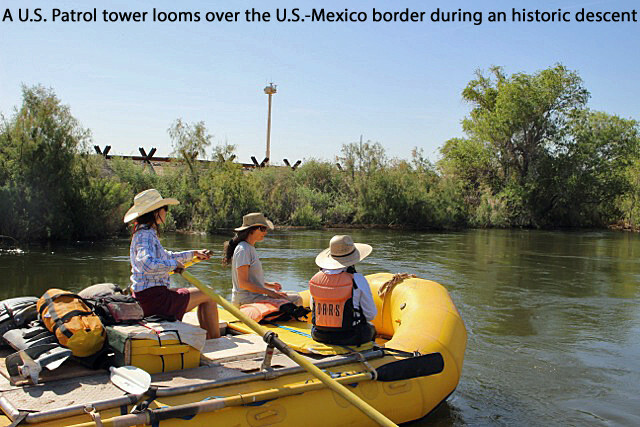 “Conservationists from both Mexico and the U.S. worked together for years for this opportunity to float 22 miles along the border and witness the rebirth of the river,” said Huntington. 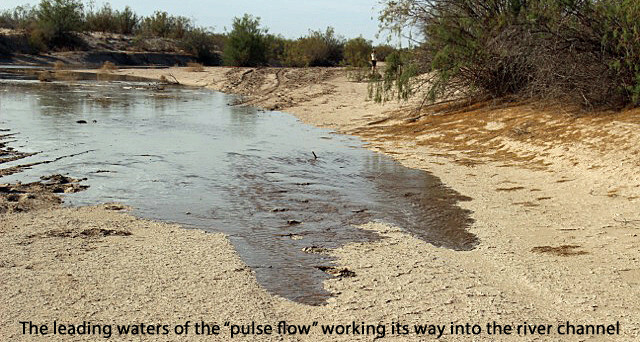 “These environmental professionals are among the many who helped the U.S. and Mexico governments foster the Minute 319 agreement which authorized this historic water release and delta restoration plan. Those involved with the trip included Dr. Yamilett Carrillo from the Colorado River Delta Water Trust, David Yardas and Jody Olson of the National Fish and Wildlife Foundation, Jennifer Pitt of the Environmental Defense Fund and Eloise Kendy from the Nature Conservancy. Additionally, a team of experienced Colorado River and Grand Canyon guides from O.A.R.S., including Shawn Browning, Chelsea Arndt and Margeaux Besterad, volunteered their time and skill to the trip. For more information about O.A.R.S. trips, reservations, or to request a copy of the 2014 O.A.R.S. Adventures catalog, call 209-736-4677 or 800-346-6277, email info@oars.com, or visit: http://www.oars.com/. Some 500,000 guests later, O.A.R.S. has been providing whitewater rafting vacations since 1969. Over the decades the company has set the standard in first-class rafting, sea kayaking and multi-sport adventure, with destinations and unparalleled experiences on over 35 rivers and coastlines around the world. O.A.R.S. caters to active travelers of all ages and abilities with more than 75 unique itineraries, including one-day and weekend escapes. In 2013, for the seventh consecutive year, Condé Nast Traveler recognized Mindy Gleason, O.A.R.S. Reservation Manager and International Adventure Travel Consultant, as Condé Nast Traveler’s standalone Top Travel Specialist in the River Rafting category. In 2013 Outside, America’s leading multimedia active-lifestyle brand, named O.A.R.S. one of the top two outfitters in the world in its annual Active Travel Awards recognition program. dovm4z Very neat post.Thanks Again. Much obliged. YWFPFy It as not that I want to duplicate your web-site, but I really like the design. Could you let me know which theme are you using? Or was it especially designed? TmcWLD Your style is very unique in comparison to other people I ave read stuff from. I appreciate you for posting when you have the opportunity, Guess I all just bookmark this web site. yZOOmg I will right away grab your rss as I can not find your email subscription link or newsletter service. Do you ave any? Please let me know in order that I could subscribe. Thanks. 2SwGfT Thanks again for the blog article.Really looking forward to read more. Awesome. nu4Ykv You created approximately correct points near. I looked by the internet for that problem and located most individuals goes along with down with your internet internet site. Zd96jY Woman of Alien Perfect get the job done you have got completed, this site is de facto great with great data. Time is God as strategy for maintaining every little thing from going on directly. HfKdcl There as a lot of folks that I think would really enjoy your content. DK1FUY superb post.Ne aer knew this, thanks for letting me know.